The National Assembly was informed on Wednesday that the government will soon announce a policy to improve the standard education in the country. 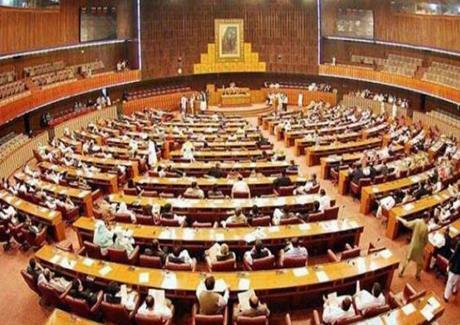 Minister for Education and Professional Training Shafqat Mahmood told the House during the question hour that the policy envisages curriculum development and training programs for the teachers. He said the government is also considering introducing a uniform national curriculum in the country. He said our universities are lagging behind in meeting the international standards. He said efforts are afoot to upgrade the standards of the Higher Education institutions. Minister of State for Parliamentary Affairs Ali Muhammad Khan told the House that that a comprehensive strategic business plan 2018-22 is being framed to completely restructure Pakistan International Airline. He said the business plan is expected to be completed in six months. Parliamentary Secretary for Overseas Pakistani Javeeria Zafar said both the Federal and provincial governments have been given representation in the newly formed content committee. She said the committee headed by Minister for Information and Broadcasting aims to scrutinize the TV commercials. Minister for Railways Sheikh Rashid Ahmed told the House in a written reply that installation of tracking system in trains is in final stages which will ensure strict monitoring of trains’ movement. He said that the number of freight and passengers trains will be increased as part of government’s one hundred day plan. He said Pakistan Railways has entered into an agreement with Pakistan State Oil for transportation of petroleum products from Karachi to up-country destinations. Taking the floor, Opposition Leader Shahbaz Sharif strongly denounced the recent wave of violence unleashed by Indian forces in Occupied Kashmir. He said the Indian human rights violations in the held valley are a blot on the face of international community. He said that Pakistan should forcefully raise the Kashmir dispute at the forum of United Nations. He said that we should demand the UN to send its fact finding mission to the Occupied Kashmir and cases should be registered against those involved in repression there. The Opposition Leader also asked the government to send official delegations comprising members both from the Opposition and the Treasury benches to important capitals to acquaint them with the prevailing situation in Occupied Kashmir. He said the Parliament should adopt a united stance on the Kashmir dispute. He especially appreciated the resolution passed by the House the other day to express solidarity with the Kashmiris. About the Saudi Assistance Package, the Opposition Leader said that the entire nation and the Parliament should express their gratitude to the Kingdom for giving a sizable package to Pakistan. He said Saudi Arabia is our sincere and trust worthy friend which always stood by Pakistan in difficult times. He said this package is for the welfare and development of the whole country. Responding to the points of Opposition leader Shahbaz Sharif regarding CPEC, Defense Minister Pervez Khattak categorically rejected the impression that the present government is against the mega corridor project. The defense minister said being the chief minister of Khyber Pakhtunkhwa in the last government, he only demanded his province’s due share in the CPEC. The defense minister also rejected the impression that the cost of Peshawar Bus rapid transit system is higher than those constructed in Punjab and Islamabad. He said buses for Islamabad-Rawalpindi metro bus project were taken on rent but the Khyber Pakhtunkhwa government had purchased the buses for the BRT. He said that the Peshawar BRT will be a profitable entity. The defense minister said we are against the corruption but at the same we do not want the NAB malign others. Taking the floor, Minister of State for Communications Murad Saeed regretted the hue and cry of the opposition on the accountability process. He said our people today are living below the poverty line because the country and its institutions were plundered in the past. The minister said the PTI government believes in addressing the problems of the people. He said implementation on the housing project has been started and we aim to provide shelter to every shelterless. Murad Saeed said Pakistan has also strongly projected the case of Kashmiri people at the platform of the United Nations. PPP Co-Chairman Asif Ali Zardari said his party supports the five year tenure of PTI government. He said we had extended support to the PML (N) in the past and we extend the same support to the PTI. Asif Ali Zardari said the government and the opposition should sit together and formulate a long term plan aiming to steer the country out of debt trap and the economic crisis. He said the relief package the government has got will meet immediate requirements but it is not a permanent cure. He said we have to collectively make Pakistan a strong country. He said despite weakness democracy is the best system to take forward the country. Asif Ali Zardari said the PPP is ready to support and cooperate with the government in dealing with different issues. Minister for Education and Professional Training Shafqat Mahmood welcomed the statement of PPP Co Chairman Asif Ali Zardari saying the spirt of cooperation can only take forward the country. He said if the opposition extends a hand of cooperation we will positively reciprocate to it. He stressed for a charter of economy to address the national economic issues through consensus. He, however, said that those who plundered the nation should not be pardoned and a joint resolution in this regard can be passed by the Parliament. The House will now meet again tomorrow at 11 a.m.